Chances are incredibly high that your company is going to experience a crisis of some kind in the next year. It’s how you handle that crisis which will likely determine whether that crisis builds or seriously damages your company. As 90 percent of a crisis response is communication, I would suggest that you think about the need to respond in real-time, as Robert Scoble suggested when he was quoted in Fast Company when he said “Reputations are created and destroyed online in the speed of 140 characters.” He obviously referred to Twitter and the common phrase today that reputation can be created (Susan Boyle) and destroyed overnight (Bernie Madoff). (Remember the plane landing in the Hudson river. Ordinary people were tweeting pictures and video footage to the networks before the Media actually got there). A crisis can strike a Business at any time; and during this crisis a Company’s image and reputation can be damaged significantly. Often, this can be a result of not responding adequately to media and other stakeholder enquiries. Understanding what Communication challenges may arise during a crisis or before one occurs is therefore critical. Speed is thus of the essence. That’s why it is vital that you develop a crisis communications and management plan or kit that prepares you in advance for this eventuality. This communication kit should assist your organisation to respond timeously and promptly to crisis situations. 1. A list of the members of the crisis management team, which should include, at minimum, the CEO, a trusted assistant/top manager from the CEO’s office, heads of each department, Investor Relations Officer details, public relations and marketing team members, legal and security. In case of actual crisis, this team will be focused down to the group applicable to that specific crisis. 2. Contact information for key officers, spokespeople, and crisis management team members including company and personal phone numbers, email addresses, cell numbers, pagers, faxes, instant message handles, Twitter addresses, even spouse’s cell numbers, should the person be inaccessible by other means. With the astute use of technology today, the above contact details could be kept in online contact databases like GIST, in Google Contacts or even in Dropbox. I keep this information in all 3 formats and have access to it via my smartphone. 3. Fact sheets on the company, each division, each physical location, and each product offered. These should be in camera-ready condition, plus available on a disk in a generally-accepted word processor format (Microsoft Word) so they can be revised and printed out if necessary on a computer external to your facilities. Photos should also be included. 4. Profiles and biographies for each key manager in your company, again in camera-ready condition and on disk. 7. Contact information for each of your key media contacts both locally, nationally, and if appropriate, key financial press and analysts. Contact information for your appropriate stakeholders like suppliers, political, regulatory, and union leaders should also be included. Don’t be afraid to go overboard here – if you have an oil spill, your CEO will probably want to call not only the Media, but also selected Government representatives. 8. Flowcharts of the Protocols & Procedures to be followed. These will differ depending on the type of crisis. For instance, in the event of death, it is vital that the Department of Labour be informed, forthwith according to the Occupational Heath & Safety Act. Obviously you first want to inform management. Then, the authorities. In the case of a fire, there may be other communication protocols to be followed. Flowcharts can help to speed up decision making. It’s important for your crisis communications kit to not only be duplicated in some offsite location, but to also include information, disks, graphics, computer files, photos, etc. that are normally readily at your fingertips in your office. These days you can also keep it in the cloud. Alternatively this information, should be in a password controlled format on your website/intranet. I once knew the Crisis Manager of a Rail organisation. She kept the copy of her plan at home, at the office and in her car. Just in case. I strongly recommend that you assemble this kit shortly. It will be one of the best insurance policies that you can have on hand once a crisis begins. Remember time is of the essence. For more information on crisis management and communications, I recommend that you check out my various blog posts. Is your company prepared to deal with a Product recall? Product recalls have the potential to seriously damage your reputation and brand name and can cause distrust amongst stakeholders and possible litigation, especially if it involves aspects of health & safety. 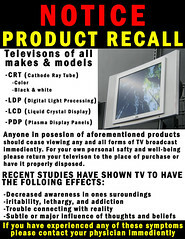 In fact a shoddy product recall could results in untimely deaths. The current product recall by Toyota is a prime example of what can happen to a company. Bad things can happen to good companies. In this case it is a removable floor mat that could cause accelerators to get stuck and lead to a crash. Just imagine that you are the manufacturers of a product that could implicate the lives of babies. Just imagine that some dangerous bacteria manages to contaminate this product and you have shipped this contaminated products and they are in use at hospitals and clinics throughout Southern Africa. What now? Lives are at stake! How will you withdraw the product from the market and how will you inform all these outlets about the dangerous situation in a way that your integrity and reputation can remain intact and not be questioned?The trick lies in being prepared just in case it happens and then reacting swiftly to deal with it, both from a reality and a perceptual perspective. The difference lies in HOW these companies respond. That difference has its origins in how well prepared the business is to deal with the hand of fate. The companies that manages to weather the storm are normally those that are prepared to deal with the crisis and can communicate quickly and decisively. But, how many small to medium size businesses even plan for this or even know what to do when such a situation comes around? Perhaps the following checklist can be helpful as a planning and action guide. (Caveat – This checklist is only a rough guide. You should work with professionals before, during and after a product recall crisis. This checklist should be developed into a particular section of the completed crisis communication plan for the business and should constantly be updated. For an example of a complete crisis management template, you could consider obtaining REPUCOMM’s Crisis Manager Toolkit). Define a recall (e.g. an event to effect removal of product from business because as a result of an identified hazard or problem) using your company or industry’s specific language. Outline how the Company is to react once a recall is in effect and who/what declares a product recall, and what decides that a recall is over (These actions will be influenced by legislation particular to your industry, Industry association guidelines, bylaws, best practice, and organisations like the SABS – South African Bureau for Standards. Quick tip – The new Consumer Protection Act that is coming into effect in October also deals with this in various means -Consumer Protection Act, 2008 (Act No. 68 of 2008), Chapter 2 : Fundamental Consumer Rights , Part H : Right to fair value, good quality and safety, 60. Safety monitoring and recall. Outline the product recall classifications and the Company’s responsibilities in each circumstance. Define the process to identify affected product. Define the traceback system and record keeping practices and where to find the information about who the product was delivered to and when. Ensure that supplier and distribution (brokers, retail, wholesalers, etc.) contact lists are up to date and include as much contact information as possible. These lists should be updated either monthly or in real-time. Investigate how you would inform the public. It is essential to plan for recalls so that you could for instance quickly and effectively be able to run an advertising campaign, especially if people’s lives are at stake. Determine the required legal and other authority notification procedures for your industry. Know what data the authorities or legal practitioners will require from the company in the event of a recall e.g: product(s) recalled (brand names, product names, code number, type of packaging); production codes and dates (sell by date or other identification codes); problem/reason for product recall; how/when hazard was discovered. Know who will be the Company contact person and who will be allowed to speak to the Media. Make sure that this person is trained and well-versed with interviewing techniques. Define the information necessary to vet the quality of product recalled (i.e. complete info on lots, production dates, distribution and location of product, accounting of all product, etc.). Have on hand or get it compiled quickly – Any information on product distribution (i.e a complete breakdown of retail/non-retail distribution and amounts sent to retailers, etc.). Prepare beforehand any relevant information on how to handle the product. This may be defined by MSDS (Material Safety Data sheets). For instance if the product is in use, how do you prevent contamination of localities i.e. water or air, etc. Ensure that you plan beforehand how you will inform all stakeholders about an incident – the authorities, the Media, the shareholders, staff and customers. Determine the procedures to handle the return of the product in a retail setting such as where customers need to hand the product back to a retailer, what the compensation procedures will be and how you will communicate with the consumer. Set up procedures at the office to handle incoming calls. Ensure that your staff will be trained on what to say and to record. Will your Call Centre be able to handle the volume of calls? Have you had a dry-run of your product recall procedure? Dusty procedures is of no use in a policy manual or on someone’s desktop. Regular training is a must. Test your quality feedback monitoring systems. prevention is better than cure. If you can deal with problems before they occur, so much the better. As you can see a product recall is not a simple exercise. Ideally you should plan beforehand and work with a number of identified experts to plan a potential recall. These experts could include HSE, PR and Legal practitioners. Will you be able to say the same, if the hand of fate strikes? That you had prior wisdom? What works in Communicating Bad News to Management and the Board? It is always hard to get on top of things once the cat is out of the bag. But in any event, it is best to follow the basic rules of Crisis Communications. Don’t add to the crisis by jumping the gun before you have the facts. Determine who is going to speak for your organization. Make sure they are prepared. Act quickly, give the media as much information as possible, they’ll get the information from other sources. Protect the integrity and reputation of the organization, inform what your policy is, what action the organization plans to take and why. Protect your organizations clients. In this case make sure they are aware of any actions which could affect them or their treatment. After it is all over, it would be a good time to meet with management and promote the importance of putting a crisis communications plan in place for the organization and make sure you are on the contact list for anything that happens in the future. I hope this helps a bit, I am sure others will have additional thoughts. Respond quickly, professionally, and positively. Don’t dribble out the story, making it necessary for the media to seek other sources. Be forthright and thorough when answering media questions. Don’t minimize the crisis by simply issuing a press release. Address the media in person through a press conference or small briefing with key reporters. Never say "no comment" when responding to questions; rather, admit what you don’t know and promise to get the facts later. Make sure facts are accurate and correct. Be consistent in your message. Use statistics and lists to help emphasize your points. They also have a better chance of being picked up in the story. No one can foresee every possible crisis, but with a good action plan and media training on your side, your firm can at least ensure media coverage that sends the right messages.